Chanteur Country US né Henri Ned Miller, le 12 Avril 1925 à Raines (Utah). 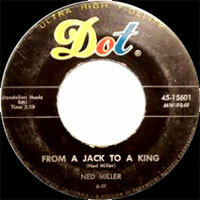 While Ned Miller was best known for his international 1962 hit "From a Jack to a King," during the 1960s he had 11 chart hits and made it to the pop charts three times. 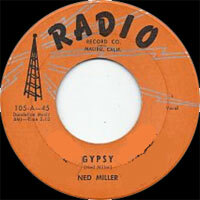 Miller was born in Raines, Utah, and started writing songs and singing at local parties and on the radio when he was only 16. 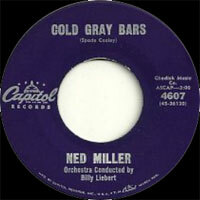 After his discharge from the Marines, Miller worked at several jobs before moving to California in 1956 to become a full-time songwriter. The following year, singer Gale Storm scored a Top Five hit with his song "Dark Moon"; Bonnie Guitar also had a hit with the composition, and both continued to record Miller's songs. 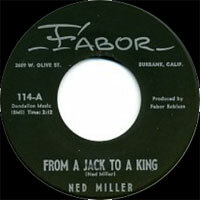 He began his own recording career in 1957 for the Fabor label, issuing "From a Jack to a King" as his debut single. 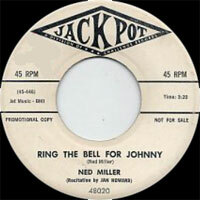 Later that year, he released "Roll O Rollin' Stone," again without much notice. 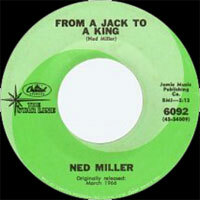 In 1962, following a short detour to Capitol Records, Miller persuaded the Fabor label to re-release his prior version of "From a Jack to a King"; this time, the single soared to the Top Three on the country charts and the Top Ten on the pop charts, and even made it to number two on the British pop charts. 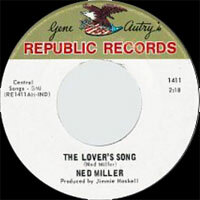 The following year, Miller scored two Top 30 hits, "One Among the Many" and "Another Fool Like Me." 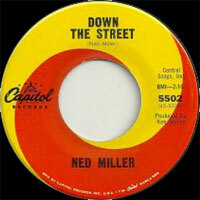 In 1965, he had another Top Ten hit, "Do What You Do Do Well," which later provided success for Ernest Tubb; Miller's version also crossed over to the Top 60 on the pop charts. Later that year, he returned to Capitol. 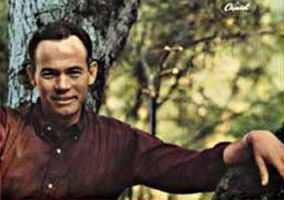 Songs he wrote or co-wrote with his wife Susan also found chart success for other artists, among them Gale Storm's "Love by the Juke Box Light," Faron Young's "Safely in Love Again," Porter Wagoner's "Your Kind of People," and Hank Snow's "The Man Behind the Gun." Miller faded into obscurity after the 1960s, but decades later Ricky Van Shelton recorded "From a Jack to a King" and had a number one hit.